What is the purpose of a track spacer? The UPLIFT Desk Track Spacer was designed to work around the center crossbar support on an UPLIFT Desk. The Track Spacer acts as a bridge so that you can mount a CPU Holder or Keyboard Tray over the crossbar support. It depends on whether you have the crossbar installed on your desks. Some desktops are thick and durable enough to not need the center rails installed. Without the crossbar installed, you will have no problem fully retracting a keyboard tray. However, if you do need the crossbar installed for additional support, you will probably not have room to install the 21" keyboard tray track. With the shorter, 11" keyboard track installed, you will have to rotate your keyboard tray in order to stow it all the way under your desk. Or you could order the track spacer and be able to install the 21" keyboard track over the crossbar! Is this compatible with with non-UPLIFT equipment? We have designed this specifically for our UPLIFT keyboard tray and CPU holder tracks and cannot guarantee that it will work with any other brand. That being said, this tracker spacer will not work with Humanscale Keyboard tracks. Can I install a different keyboard tray track on an Track Spacer? We can only guarantee that the Track Spacer will work with UPLIFT products. The pre-drilled holes on the Track Spacer align with the holes on the UPLIFT Large and Switch keyboard tray tracks as well as the track for the UPLIFT CPU Holder. Why would I want a track spacer? A track spacer gives you more flexibility to install under-desk accessories by creating a bridge over the center support. It is a highly functional accessory that will make it a little easier to place your keyboard tray and CPU holder exactly where you want them on your desk. 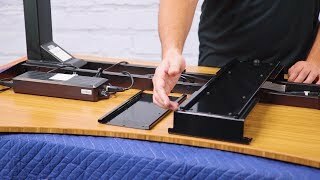 Do I need a track spacer if I'm installing an UPLIFT Keyboard tray on my non-UPLIFT desk? We cannot guarantee that our UPLIFT Desk Track Spacer will be compatible with a non-UPLIFT desk due to the differences in how other desks are constructed. You will want to reach out to one of our Sales Pros to confirm that the Track Spacer will work with your unique setup.